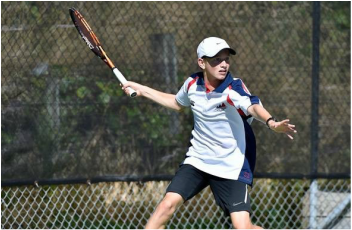 ​While most teenagers spent their summer at the beach, George Stoupe from Hutt International Boys’ School was hitting tennis balls with some of the best players in the world. The 17-year old was a part of a Tennis New Zealand contingent training and on standby to support talent at the ASB Classic in New Zealand. “I got to hit with Fabio Fognini, Taylor Fritz and met David Ferrer,” Stoupe reveals. “We were staying about ten minutes away from Stanley Street and if somebody needed a hitting partner we got a call. Typically you would spend between 30 to 45 minutes on court. Fabio was really relaxed, but others were pretty intense which was nerve-racking,” Stoupe continued. Stoupe’s nerves would soon be amplified further. Being in the right place at the right time earned him a late wildcard into the main draw of the doubles. Stoupe and Kiwi partner Ajeet Rai would appear on centre court against Austin Krajicek and Artem Sitak, more than a decade their senior. “It was a huge surprise to get a wildcard and play on centre court. I’ve never played in front of a crowd that size before. It was a fun and invaluable learning experience. The crowd was great. Because we were the underdogs they really got behind us,” Stoupe enthused. The rookies lost bravely 6-3, 6-2, but a taste of the top is strengthening Stoupe’s ambitions in 2019. On February 26 he will compete in two grade one ITF tournaments in Thailand and Malaysia in an attempt to boost his junior world ranking of 226. Grade one tournaments are the highest ranking tournaments outside junior Grand Slams and strong performances in South East Asia will open up all sorts of possibilities. “It’ll be some of the toughest competition I have faced and the heat and humidity will be a major challenge,” he says. Stoupe has positioned himself for further advancement after a successful 2018. He started the year by winning the New Zealand Under-16 singles and doubles titles. In July there was an international breakthrough when he won an ITF Junior Doubles championship in Brisbane and a month later he tasted single and doubles glory in an equivalent event in Hamilton. In December, Stoupe accomplished a rare feet by winning the National Under-18 singles title without dropping a set in Auckland. Stoupe’s triumph means he has captured national honours at every age group. In the decider Stoupe beat Isaac Becroft from Wellington College who is now on scholarship at Mississippi State University. “I must have played Issac about 20 times. I’ve won the last few, but he’s had some good results too. We get along fine off the court, but on the court we are competitive. I was really happy the way I played in December,” Stoupe reflected. 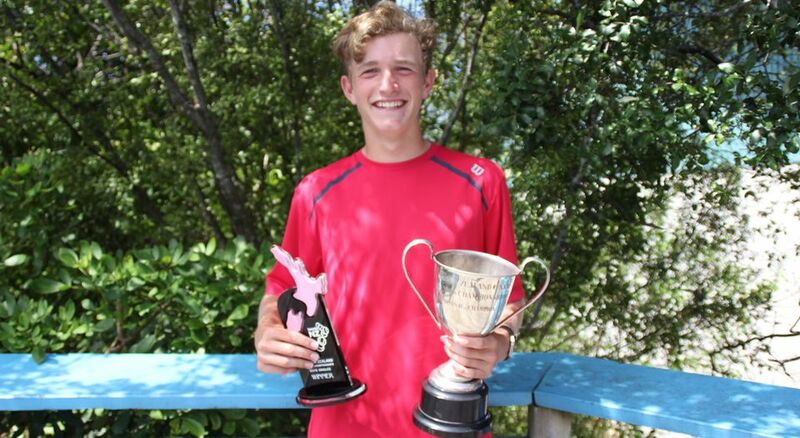 Stoupe was named Tennis New Zealand Junior Male Player of the Year and is currently the number one ranked under-18 player in the country. On the ITF tour he has fashioned a 44-19 win/loss record in singles and 51-18 in doubles. “I played terribly. 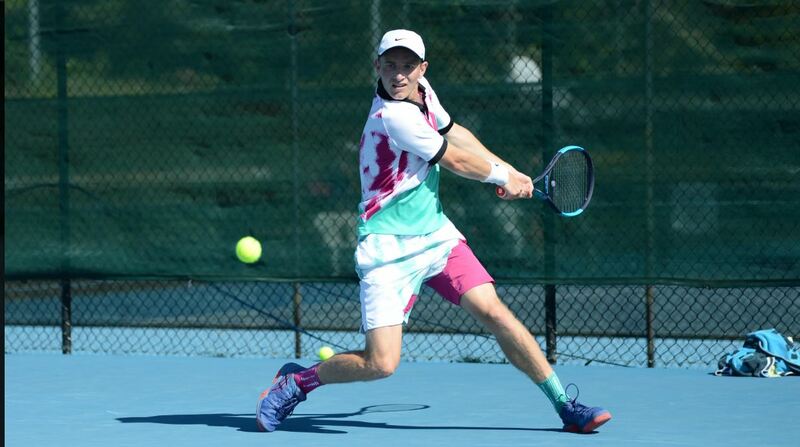 I didn’t strike the ball at all well,” Trae Innes complains when reflecting on his performance at the Super 8 tennis tournament in Papamoa this week. Despite the personal frustration of Innes, Hamilton Boys’ High School managed to win the Super 8 title for the first time since 2012 earning a place at Nationals later in the month. The humble Innes was quick to praise his teammates. “I’ve been to four Super 8 tournaments and this one felt the best. It was really competitive and our team played awesome,” he acclaims. The Super 8 tournament is contested over six matches (four singles and two doubles) per tie. The format is the same at Nationals. The Hamilton team was: Innes, Anton Shepp, Liam Barry, Jordan Taylor and a reserve. Hamilton defeated Palmerston North Boys’ High School and Tauranga Boys’ College B in pool play before eliminating Napier Boys’ High School 4-2 in the semi-final. The final was contested on a hardcourt against the top Tauranga Boys’ College outfit. Tauranga boasts two players ranked inside the top ten nationally in their age group. Shepp is Hamilton’s highest ranked player, standing sixth in the National U16 age group. Sheep was vital in Hamilton’s success. “Anton is a great baseline player. He hits the ball hard and has a big serve. We got up 3-1 and managed to win on a countback. A lot of that was due to Anton,” Innes stresses. Taylor only dropped one match all week despite being seeded third in the Hamilton team. “The countback goes on who wins the most sets then games. It was close. Our goal was to make Nationals and we did that by winning Super 8 so we are delighted,” Innes says. Innes competes regionally for Waikato. He describes his own game as being “baseline driven.” He started playing competitively when he was eight following encouragement from a tennis coach who observed Innes playing casually and was impressed with his superior ability. Innes is a Year 13. In the winter he plays rugby as a halfback or first-five. Scots College, Wellington are the defending National champions. The National Secondary School champions are being held at Trust Power Wilding Park, Christchurch from March 19-22. “Everything has got better,” George Stoupe enthuses when reflecting on his summer of tennis. 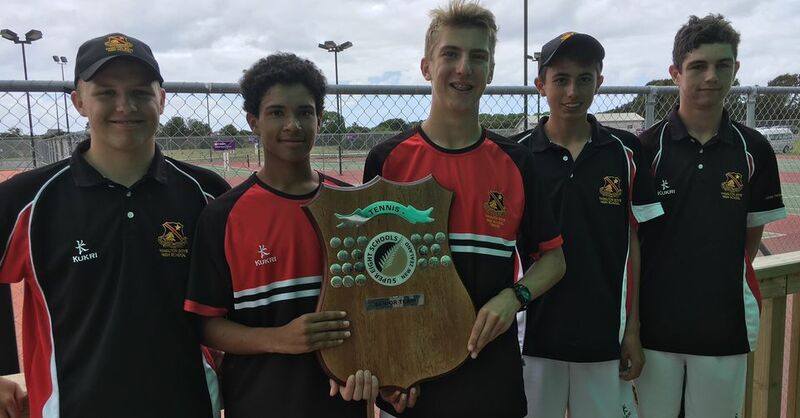 The Year 12 student at Hutt International Boys’ School is the top ranked Under-16 player in New Zealand and in January won the National singles and doubles titles in that age group. “My serve and forehand still needs a lot of work, but everything has got bigger which has given me more confidence,” Stoupe reflects. In a rematch of the National Under-14 final, played on the same court, Stoupe rallied from losing the first set 4-6 to overcome his doubles partner Chris Zhang 6-2, 6-1. “It was a close first set. A couple of the big points went his way and suddenly the set was gone. I played real solid tennis in the next two sets. I mixed things up more and was able to out rally Chris,” Stoupe explains. Less than an hour later Stoupe and Zhang had to combine in the doubles final. Stoupe has boosted his singles world ranking to 400, despite limited international competition. Stoupe has competed in three ITF tournaments in Wellington, Christchurch and lastly Auckland. ITF tournaments are graded 1-5 with a Grade 1 tournament being the highest ranked tournament. Grade 3 is the highest ranked event played in New Zealand. Stoupe was twice a semi-finalist in Grade 3 tournaments. “My goal is to get enough points to compete in the junior Grand Slams next year. That will allow me to test myself against the best players in the world,” Stoupe reveals. Stoupe more than tested New Zealand’s top ranked Under-18 player Finn Reynolds at the Under-18 Nationals. Stoupe was up 6-0 and 4-3 against the US based talent before losing in three sets. Stoupe will take a short break from competitive play before seeking some international tournaments later in the year. Stoupe managed to achieve a merit endorsement in his NCEA Level 1 exams, but will seek a recount for excellence given he was only two credits short of that rank. 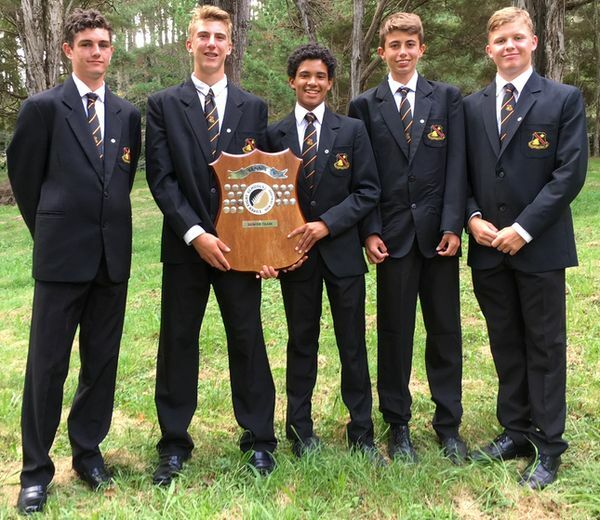 Note: A highlight for George last year was his selection to play for New Zealand at number one in the New Zealand Junior Davis Cup Team that competed in India in April 2017. The team finished 9th out of 16 teams in the Australasia qualifier for the World Group. The top four countries advanced to the World Group. New Zealand lost to eventual champions Japan in pool play. Finn Reynolds arrived at the Australian Tennis Open in Melbourne a month ago with little expectation of success in the doubles. His original partner withdrew because of injury and Reynolds had singles commitments. Reynolds’ meeting with Portuguese player Durate Vale soon changed the Kiwi's priorities. An instant chemistry was forged as the unseeded pair made a giant killing run into the final. "I met Durate three days before the tournament and we got on really well. He is a really good player and our styles complement each other. When my original partner withdrew I was lucky to meet someone so talented and likeable," Reynolds acclaims. Reynolds became the first New Zealand male since Steve Downs and James Greenhalgh, who won the Wimbledon juniors in 1993, to make a junior grand slam final. Unfortunately Reynolds and Vale fell to Yu Hsiou Hsu of Chinese Taipei and Lingxi Zhao of China in the decider but the match was a cliff-hanger settled in a third set tiebreaker. "They were an experienced pair and played really solid tennis. We got a bit lucky in winning the first set 10-8 in a tiebreak. They didn't make any errors after that and we made a couple of small ones and that was the difference," Reynolds recalls. In the semi-finals Reynolds and Vale eliminated top seeds Toru Horie and Yibing Wu from Japan and in the first round accounted for third seeds Corentin Moutet and Ergi Kirkin from France. "It's the best tennis I have played. I felt really good throughout the tournament and was lucky to have such a good partner. It's a great start to the year," Reynolds says. This coming week Auckland based Reynolds departs for tournaments in Thailand and Malaysia. If Reynolds can score some victories and boost his ranking into the top 60 in the world he has a chance to qualify for the remaining three Grand Slams in 2017. "My goal is to make the other three Slams which aren’t that far away. To get exposure at those tournaments would be huge for my game," Reynolds admits. Reynolds has been playing tennis as long as he can remember. His parents are actively involved in the sport. His first major success was finishing third at the Under-11 Nationals and being named in the New Zealand Under-12 team that toured Australia. Last year Reynolds spent five months in Europe and a month in Asia training and playing to push his combined under-18 world ranking into the top 100 in the world. Reynolds is grateful for the support New Zealand tennis provides and could be a Grand Slam regular very soon. P.S. Reynolds initially completed his schooling at Napier BHS and Rangitoto College before switching to online study. 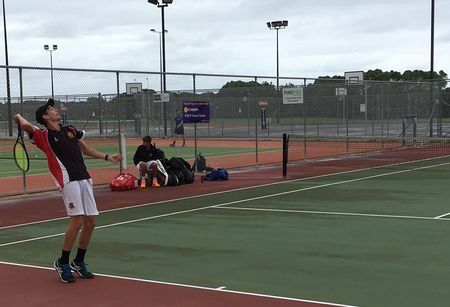 The National Secondary Schools' Tennis championships were held in Auckland last week. Each school was represented by five players and competed in six-match rubbers - four singles and two doubles. The action was hot! St. Kentigern College was defeated by Scots College in the 2015 decider, but went one better in a 2016 final replay. The team of Sean Kelly, Connor Williamson, Liam Stoica, Freddie Cashmore-Chatwin and Sean Kelley breezed into the final. Palmerston North Boys' High School, St. Peter's, Cambridge and Wakatipu High School were all beaten convincingly in pool play. St. Kent's beat Palmerston North 6-0 and only dropped 15 games. They accounted for St. Peter's by the same score, completing seven love sets. The doubles pair of Kelley and Stoica dropped a set against Wakatipu, but St. Kent's still prevailed 6-0. Auckland Grammar School was expected to provide more resistance in the semi-final, but that wasn't the case. St. Kent's won 6-0 and only dropped two sets in the tie. The final was an epic tussle. Both sides won three matches each, but St. Kent's won more games, 52-51. Kelley and Williamson completed the tournament undefeated. Kelley only dropped seven games in five matches and completed seven love sets. Westake Girls' High School won the girls tourney. Lauren Alter, Brooke Kenny, Paige Alter, Deshma Weerapperuma and Amily Suga were the victorious team members. In pool play Westlake was only briefly extended by Kapiti College. Lauren Alter dropped a match, but Westlake won 5-1. New Plymouth Girls' High School and St. Margret's College were beaten 6-0. In the New Plymouth match Westlake won five sets to love. In the semi-final Westlake lost the first two singles rubbers and was facing elimination. However Kenny thrashed Jordan Berry 6-1, 6-3 changing the momentum of the tie. Kenny and Lauren Alter teamed up to win the last doubles match 6-1, 6-2. In the final Westlake sealed victory when Kenny, who didn't lose a match in the whole tournament, defeated Victoria Hockely in a three-set thriller, 6-4, 4-6, 10-6. The final score in the decider was 5-1 to Westlake. St. Andrew's College won the mixed event. The winning team was: Vera Goesmann, Lily Bray, Edward Batt, Nic Jenkins, Holly Matson and Jamie Garbett. St. Andrew's won their two pool matches against Wanganui High School 6-0 and St. Kentigern College 5-1. In the Wanganui match, St. Andrew's won four sets to love. The semi-final against Mount Albert Grammar School was a tough tussle. S. Andrew's was down 2-1, but roared back to win. The boys doubles pairing of Batt and Jenkins won the last rubber 6-2, 6-1. In the final St. Andrew's scored an even easier win over St. Kentigern that what they achieved in the round-robin. St. Andrew's didn't drop a set in winning 6-0. 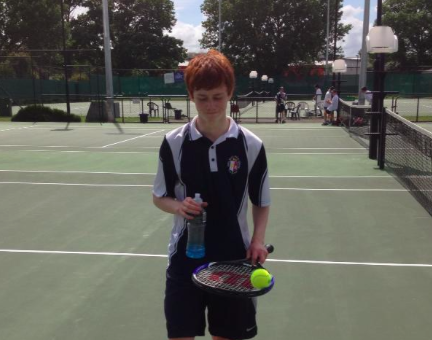 George Stoupe from Hutt International Boys’ School secured the Number One ranking in Under-14 boys tennis in late 2015. He has strengthened that status over a busy summer. Stoupe has made two trips to Australia and except for Xmas and Boxing Day has been training or playing the rest of the time. The Under-14 Nationals were held at the Scarbro Tennis Centre in Auckland in January. Stoupe was the top seed, but almost relinquished that standing in the semi-finals against Jamie Garbett. Stoupe recalls what happened. Earlier Stoupe had dropped a set in earning a difficult victory over his doubles partner and fellow HIBS student William Brownlie. Stoup admits it’s tough playing singles against his close friend. Stoupe and Brownlie won the doubles title for a third consecutive year beating the Canterbury pair of Garbett and Reece Falck in the final. In the singles decider Chris Zhang would prove to be fierce opposition. The boys are close friends and the conditions would have a major bearing on the match, Stoupe explains. Stoupe prevailed 7-6, 7-5 and later added the Under-16 mixed doubles title with Janvhi Clark from Waikato Bays. Perhaps the highlight and biggest learning experience of the summer for Stoupe was his time in Melbourne. In mid December he competed for New Zealand in the ‘Big December Showdown’ which features 32 leading Australian, Japanese and New Zealand players. Stoupe with a wildcard finished tenth in the singles and was fifth with the Kiwis in the teams event. “I was pretty happy with the way I played. I got better as the event went on. The heat was hard to handle. It got up to 35 degrees on some days. The speed of the courts was quicker than any surface I have played on,” Stoupe says. In January Stoupe returned to Melbourne as a spectator at the Australian Open. He got to watch World Number One Novak Djokovic play. Note: Stoupe was a member of the Central team that won the National Teams Event in January. He won all six matches he was involved in.